I am really proud of my knitting last year. I took on new challenges for techniques. I knit with yarn I had deemed "too precious to knit yet". And my purchases stayed on target with what I was wanting to knit, for the most part. 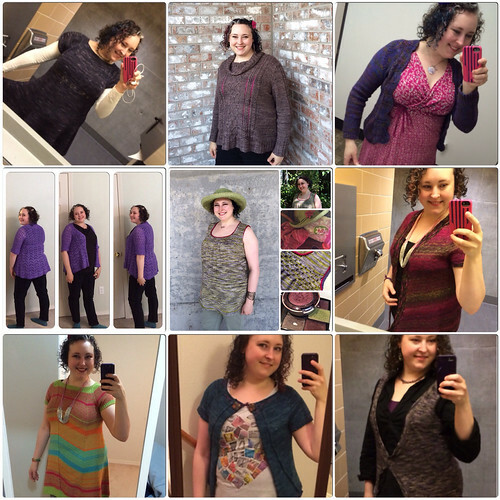 yardage knit in finished projects: 25,349 in 43 projects + yardage of several samples not tracked. I knit with notable stash as old as from Oregon Flock and Fiber 2008, a Knit Picks warehouse sale from 2009, the second Sock Summit in 2011, my handspun from Tour de Fleece in 2011, among others. types of projects: NINE tops (over 10k of yardage was in that category). 15 shawls, 7 pairs of socks. 4 kid/baby items, 4 hats, 5 cowls, and 4 others which included a blanket. Among those counts were samples and test items, as well as prototypes for my own designs, with a couple of gifts and commissioned items. I learned a new favorite heel (Fish Lips Kiss Heel). I knit fair isle. 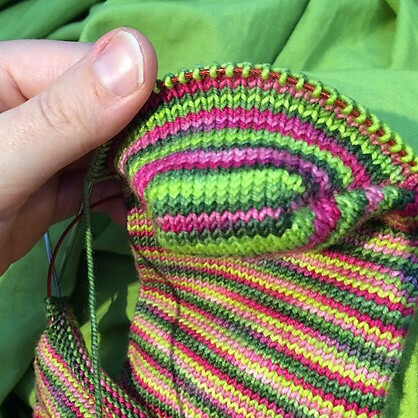 There was much striping, to use stash and because I love stripes. I did my first real seamed sweater and used the CustomFit system. I spent time with my niece in her knitting most months of the year. And I taught my first class in public, two sessions of it! I attended the Rose City Yarn Crawl, Zombie Knitpocalypse, and Rhinebeck. I participated in event KALs for each of those, the Ravellenics games, Tour de Fleece, and bunches of podcast KALs too. I participated in the knitting community more, with conversations on podcast forums and Instagram (@kdlb). I re-started my podcast and found a new format in video that fits my bubbly self. Episodes 26-41 came out between mid-September and the end of the year. I found that I love having a pair of socks, an accessory like a shawl, and a garment on the needles. And when I keep conversation knits at hand, I get accessories done while traveling, worshipping, and playing board games. knitting makes me very happy!